This month’s victim is the lovely Janice, aka Janicu of Janicu’s Book Blog. We met Janice in person at BookExpo America 2010, persuaded her to pick up far more ARCs than she really needed, and coerced her into doing a guest dare for us. Janice revealed that despite having Juliet Marillier’s first novel on her TBR for ages, she had yet to read her work – and of COURSE we couldn’t allow that to continue. No siree – we demanded right then and there that Janice get off the procrastination pony and read Daughter of the Forest. And what better way to enforce that then an Official Guest Dare? Why did we RECOMMEND this book: Are you kidding us? We freakin’ LOVE Juliet Marillier. For many years (perhaps something like 3) I’ve had Juliet Marillier’s Sevenwaters Trilogy (technically no longer a trilogy), languishing in my TBR. This is apparently a crime in certain circles. Book blogging circles. Of course the inevitable conversation happened at BEA this year. 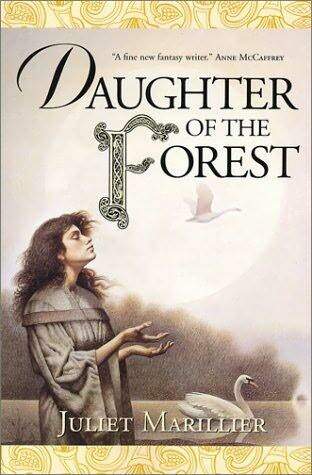 Angie from Angieville has been nagging me online about certain books I need to read, and you can imagine the conversation when it was discovered that I still hadn’t read Daughter of the Forest. Ana and Thea joined in, and before I knew it, I’d agreed to do a guest dare on the Book Smugglers. The Premise: This is a retelling of the fairy-tale of The Six Swans, but set in ancient Ireland. The narrator of the story is Sorcha, who is the seventh child and only daughter in the Sevenwaters clan. Her big brothers Liam, Diarmid, Cormack, Conor, Padraic, and Finbar, are all protective and close, and while their father is distant after their mother’s death, the siblings grow up happy, if a little wild. Their father and his neighbors are at war with the Britons, in particular a family called the Northwoods. Sorcha is aware of this war, but sheltered from it because she’s a girl. To Sorcha, it’s just the reason why her father is often gone and sometimes takes her eldest brothers. Then one day their father returns with a strange woman, Lady Oonagh, who no one likes. This woman has powers which she uses for deliberate harm, but their father is oblivious to any danger, and marries her. Sorcha and her brothers try to mount a defense but all six brothers are turned into swans. Sorcha is alone and unprotected, and has to reverse the curse in complete silence. Then an unlikely protector is sent to her in the form of a Briton. My Thoughts: Sorcha begins her story with her childhood, growing up in her family’s lands with her brothers. Left mostly to their own devices, the boys and Sorcha focus their individual learning to things that interest them the most. In Sorcha’s case it’s plants and healing. Her oldest brothers, Liam, Diarmid, and Cormack are taught the art of war and fighting and often leave with their father on his campaigns against the Britons, but Conor, Padraic, Finbar, and Sorcha are readers, dreamers, and healers, and stay at home, keeping their household and nearby village running as usual. It’s established early on that magic is a part of the lives of those living in Sevenwaters. Sorcha and her brothers have great respect for the land and trees. Their lands protect them through some supernatural means, and tales of the fairy folk, who have irrevocably changed a fool or two in the village, are matter of course. That Sorcha can communicate with her closest brother, Finbar through a mental link, or that Finbar can see things happening before they do is not questioned by Sorcha either. Sorcha’s childhood is relatively uncomplicated but things change. Change, sometimes for the best, sometimes tragic, is an inevitable part of life, and this story spans over three years, so settings and players change around Sorcha in that time. The idyllic days of Sorcha’s childhood disappear when she first begins to understand the price of the war between her people and the Britons. Her first experience with the war is when she tries to help a boy, close to her age, who was tortured by her father’s men. Again things change when Lady Oonagh enters the picture. And again when her brothers are turned into swans. This keeps happening. As soon as I began to get used to Sorcha’s life, something would drastically change in it, which lent a bittersweet tinge to the story. Things happen that you don’t necessarily want to happen. Sorcha loses her innocence; her brothers can’t be there to protect her from attack; she has to leave her home; the evil Lady Oonagh seems to win. Through out the ordeals that Sorcha must endure in silence, she keeps working on those shirts for her brothers. I think as a reader, I was with her, holding my breath, willing her to keep going despite each setback. By today’s standards, Sorcha is incredibly young (she’s about 12 when she is tasked to save her brothers from their curse), but the hardest thing was knowing that Sorcha must not speak, and I mentally railed against all the people who judged her and made assumptions which she could not counter. The vilest people were those who exploited her silence and her vulnerability in their attacks. The strength of Sorcha’s love for her brothers is evidenced by her suffering, and she endured herself to me even more because she told herself stories to keep her mind off what she was going through. What reader hasn’t done that?! Storytelling itself is an important aspect in Daughter of the Forest, as comfort to Sorcha, as a tradition, and to convey larger concepts. I loved how this was incorporated into the book, and there was a pivotal scene that involves a story which I want to gush over but can’t for fear of spoilers, but let me say it makes the book. While Sorcha suffers stoically through this book, it made the positives that happen that much sweeter. Sorcha gets a protector in Red, a Briton who saves her from drowning. He’s a dependable and responsible hero. In his lands, he’s very respected, and although his people are shocked when he brings Sorcha home with him, no one challenges his decision, because he’s never been known to do things wrong. I loved Red! He’s now, hands down one of my favorite heroes. The phrase “still waters run deep” is true in their case, and his relationship with Sorcha is full of quiet but meaningful moments. I may be a bit different from other bloggers because this dare was for a book I already meant to read, not for a book in a genre I’m uncomfortable with, but thanks guys for pushing me to get this book read. I tend to love a fairytale retelling and this one was wonderful, albeit bittersweet in flavor. It won’t take me so long to get to the next book in this series, Son of the Shadows, I promise. Overall: If I were to sum up this book in one word, it would be “romantic”. The writing is rich and elaborate, and the story is a fairytale retelling but it’s layered with complexity – with the highs and the lows of human experience mixing with magic and wonder. There was also an element of nostalgia in the storytelling, as if I was looking back to times long past which added another layer of romanticism to a lovely tale. In the Book Smuggler rating system I would give this an 8 – Excellent. OMG I had never heard of this book and yet it is based on my favourite fairy tale from when I was a kid!!! I have to ask if it contains my favourite scenes from the fairytale …. making massive spoiler space here …. the scene were she has to gather the nettles from a ghoul filed graveyard. And the scene where,after her children are murdered, she digs a hole and screams her pain into it. It is truly the darkest fairytale I have ever read – filled with wonderful crazy dark imagery like above ( the final scenes of it – which in the fairy tale take place on the heroine’s execution scaffold – are stunning) I wish I could find my original edition of it, but alas so many house moves have sent it wandering. This one sat on my to-read pile for ages too, but after reading Ana’s review, I finally got around to it, and I absolutely loved it. I’m on the Juliet Marillier bandwagon now, having just finished Wildwood Dancing (loved it). I’ve got Son of the Shadows and Hearts Blood on my pile now, and I can’t wait. This is an awesome feature! I need to challenge myself to read outside my comfort zone for sure! I probably would never read this book..perhaps I should give it a chance after this review! I really liked this one and criiiiiied! @Celine – I’d love to know what version the one you’re speaking of is! Sounds really dark. Let us know if you find it. @Etta – Glad to know you loved it and recommend WILDWOOD DANCING. 🙂 I’m going to continue this series then look for her other ones. @Jamie – Oh do give it a try. It’s something special. @Jenny – Wow, you reread it 3 times. Definitely a favorite then? And yes, I am on the Red bandwagon! You have arrived, Janice. 🙂 I’m seriously delighted you gave this an Excellent rating. And that you enjoyed the wonderful atmosphere and writing and romance. In my opinion, SON OF THE SHADOWS is just as good. So I hope you get to it soon. hehe. @Angie – Well it seems that you are always right. Red is awesome because he acts like a grown up. He’s always trying to do the right thing, does what he says he will, and there’s no drama. His actions speak for him, but when he does speak, it means a lot. That is pretty attractive. @melissa I see that Angie has been very active in her book pushing! Haha. @ janicu: I wish I could find it. From what I recall of it, it was one of those late Victorian/early 1900’s hard-backed illustrated books(probably my Nana’s) It had amazing full page black and white drawings. If I’m thinking of the same book it also had some pretty dark versions of other fairytales ( you know the ones I mean – the original version of Cinderella where they put the wicked stepsisters feet into boots of red hot iron: the original red shoes where they have to cut the girls legs off) Most of them scared the poop out of me and made me very uncomfortable, but the Seven Swans was so amazing that I came back to it again and again and can recall drawing many pictures of it. I loved your review btw I’m sorry I forgot to say that! I’m looking forward to hunting down this version and reading it! Yay! You read it! And loved it! So very happy – wonderful review. Excellent review – this book sat in my TBR pile for *ages* as well, but once I read it, I immediately had to get the next two books. I’ve tried before, but never have been able to decide on my favourite out of the three “original trilogy” books – the last may just edge it though, just because of the way it wraps everything up. I loved this book too, as well as the fairy tale. the version I read had no ghouls nor children of the Sorcha character, as far as I can recall. I’m pretty sure she was a ‘maiden’ for the whole nettle-picking/spinning/weaving/sewing silent ordeal. Hmmm, might be time for a re-read. Of both. Lovely review Janice – thank you! This is apparently a crime in certain circles. *GULP* I’ve read Heir to Sevenwaters, which I adored, but for some reason stalled on this book. I think I was in the wrong headspace so am going to try again (hopefully soon) as Heir to Sevenwaters was amazing IMHO. I’m all alone in Blogger land because I read Juliet Marillier and was thoroughly unimpressed by “Heir to Sevenwaters.” *sigh* Glad you liked this one, though! @Michelle M @Li @Nicola O @Tiah – wow, this really is a beloved series. I guess I better hop to with the second and third books. I’m encouraged to hear that people liked the other books in the series too. @orannia @Kristen – Yeah don’t go blabbing to Ana and Thea or Angie about not reading these books yet. They’re going to come after you! @AnimeJune – ohh, and I tend to agree with your opinion. I guess I’ll see what happens when I get to HEIR TO SEVENWATERS. Great review! I love both Sorcha and Red, they are great characters. Red’s storytelling near the end of the book is very sweet. I couldn’t get that out of my head days after I finished reading. I think it was also Angie who urged me to read this wonderful book. It was already in my wishlist but she asked me to read it as soon as I got it and I’m glad I did. I loved it. 🙂 Right after I read it, I included Daughter of the Forest in my list of favorite books. Son of the Shadows is just as good. I’m currently in the middle of Child of the Prophecy and I look forward to reading more of Juliet Marillier’s works. Well, I do think that Daughter was the best of the Sevenwaters books by a fair stretch. I have read almost everything Marillier has written and some bits definitely better than others. I love her writing but I think sometimes her premise, or maybe her plotting fails me. They’re lovely chewy books but can bog down sometimes. @Bella F – Yup, seems to be a trait of a booklover! @Chachic – Thanks! OK I’m really going to read SON OF THE SHADOWS soon. Lots of positive opinions on it. @Nicola O – You’re the second person (I think) who said they liked DAUGHTER OF THE FOREST best. Hmm. Interesting. I will have to see if I think the same or not. (until Sorcha gets gang-raped), then read the last 1/3) which was really sweet. I found the middle part way too painful and just skimmed it. I’m trying to nerve myself up to go on to Son of the Shadows and the rest of the series. If it has as much ‘torture, pain, and death’ as DOF, then I’m not sure if it will work for me. I did read and very much enjoy Wildwood Dancing, Cybele’s Secret, and Heir to Sevenwaters. I read Heart’s Blood as well and found it enjoyable although the hero was a bit too passive for me. Yay! I love this book and Juliet Marillier. After DOTF I read everything she’s published – she’s just my cup of tea. I third everyone else, PLEASE read Son of the Shadows soon! I think it’s just as good. @Anon – Yeah I had a hard time with that too and wasn’t sure whether to mention it in the review as a warning or try not to give spoilers. In the end I alluded to it. I already had a comment on my blog from someone who figured out that’s what I was saying. I get why it would be hard to keep reading there. @Holly – (Happy belated birthday!) Ah peer pressure! 😀 Yes I will try to be good about reading it soon. You have permission to make sure I do.